Six-year-old Katie has a chipped baby tooth from when she ran into the coffee table as a toddler. When Katie gets teased at school she tells her Grandma about it. Katie’s Grandma tells her a funny story and encourages her to use humor instead of getting upset to solve her problems. This charming story offers a different solution to bullying for kids. My children enjoyed the story and learned a valuable lesson as well. For more information on When Grandma’s False Teeth Fly visit tatepublishing.com. 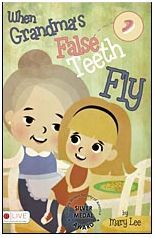 About the author, Mary Lee : When Grandma’s False Teeth Fly is Mary Lee’s second book. Her first book, My Air Force Mom was a winner in the Children’s Fiction Category of the 73rd Annual Writer’s Digest Writing Competition. Mary Lee is a retired Air Force Master Sergeant and a Licensed Master Social Worker. Mary and her husband Chuck reside in Columbia, South Carolina. Related School's Out - Now What?